If they were handing out awards for the best dressed action figure of the 1970s then you can bet that Steve Austin's boss at the OSI - that's the Office of Scientific Intelligence to any readers too young to remember cult TV show The Six Million Dollar Man – the always dapper Oscar Goldman would certainly be in the running for top prize! Kenner did a wonderful job with this 12-inch figure – the attention to detail with his plaid jacket (including buttons), dazzling green turtle-neck sweater, tan trousers, as well as socks and slip-on shoes, was absolutely spot-on. 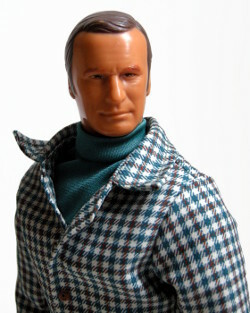 As with their version of Lee Majors, the likeness to actor Richard Anderson was also extremely good. Honestly, what vintage action figure collection would be complete without one of these figures!? Oscar Goldman has a very special briefcase. If opened correctly, the briefcase contains secret files, radio headset and video scanner. However, if the enemy opens the briefcase, it "explodes"! 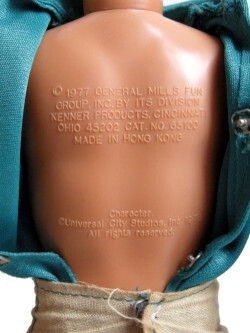 World's longest copyright info on back of figure! Yes, that's right folks, the Oscar Goldman action figure was issued with an exploding briefcase – the lid would fly off and the interior changed to appear as if it had been destroyed if opened in a particular way - even though said gadget never actually featured in the TV show. Sadly, I picked up my loose Oscar for a very good price online, but his essential briefcase was missing – am determined to track one down! Incidentally, Bif Bang Pow! 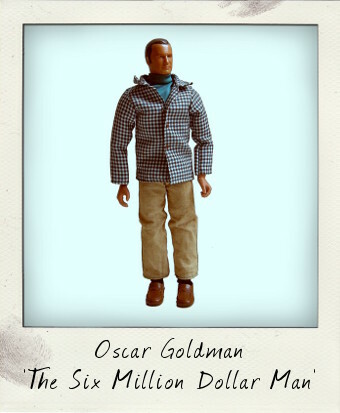 and EMCE Toys will be releasing a new series of 8-inch Six Million Dollar Man retro-style action figures this summer – Oscar Goldman included - so now would be an excellent time to snap up a vintage original before these new figures stimulate a new wave of collecting frenzy!